Making the connection between food production and the changing seasons is traditional in many parts of the world. Produce not only tastes better at its peak when grown in season, it is cheaper to buy, and matches well with other foods that are grown at the same time and from the same region. In France many farmers feed their animals from food grown within close proximity of their farms to retain the terroir. This element of localised food production is treated very seriously and is definitely not to be conjured with. I cannot claim regional terroir in this recipe, although the autumn combination of fruit, lamb, rosewater and pomegranate delivers a balanced and seasonally matched Middle Eastern influence. To allow the lamb to infuse with flavour and make the most of these delicate and subtle ingredients, prepare this dish one or two days in advance of serving. If serving this dish as an evening meal, cauliflower puree is an elegant addition to the lamb shanks. If serving this dish as part of a relaxed feast, jewelled couscous also works well. This quantity should serve 6. Heat three tablespoons of olive oil in a large oven-proof frying pan or dutch oven. Brown three lamb shanks at the time on all sides and repeat with the next three shanks. Set aside. Add the onion, carrots and garlic to the pan and fry until lightly browned. Add the ground cardamom and the cinnamon sticks and season with salt. Cook, stirring for about one minute. Stir in the pomegranate juice and three extra cups of water, scraping up the browned bits from the bottom of the pan. Add the reserved lamb shanks to the pan, arranging the meatier part of the shanks to be submerged in the cooking liquid. Cover pan with a lid or with a couple of layers of foil. Transfer the pan to the oven. Cook, basting and turning shanks each hour, until the meat is tender and almost falling from the bone. This will take approximately three hours. When done, remove from the oven, uncover pan and add the pears, pushing them down to submerge in the cooking liquid. Let cool to room temperature, and cover and chill overnight. Preheat the oven to 200C and remove pan from the fridge, scraping off the fat that has set on the top and discard. Heat the lamb mixture over a medium heat to soften the liquid until warmed through. Gently remove the shanks from the liquid and transfer them to a large rimmed baking tray. Spoon half a cup of cooking liquid over the top of the shanks. Place the tray into the preheated oven and roast the shanks, basting with the juices until glazed, for about ten minutes. Gently remove the pears from the cooking liquid and set aside. Strain the remaining liquid through a sieve, reserving the liquid and discarding the vegetables. Return the strained liquid to the frying pan and add the rose water. Cook until the sauce reduces and thickens, about ten minutes. Add the pears to the frying pan to reheat through. 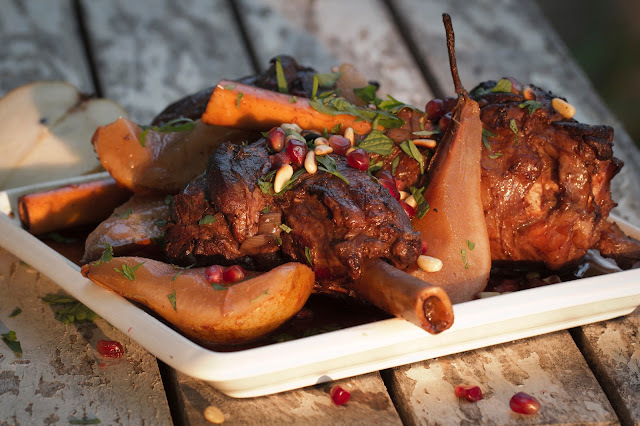 Serve the lamb shanks with the pears, a drizzle of sauce, topped with the herbs, pomegranate seeds and pine nuts.